VietNamNet Bridge – Lawyers have warned that if VietinBank denies the responsibility for its worker’s behavior of appropriating institutions’ and individuals’ money, depositors would keep away from banks. Economists have advised the people who have idle money to deposit the money at banks, because this is the most profitable and safest investment channel in 2014. However, Huong, the owner of a private business, remains indecisive about what to do with the money she has saved for the last many years. The stock market is still gloomy and the gold market keeps quiet, while the real estate market has been frozen. Meanwhile, depositing money at banks is not as safe as people thought. “The Huynh Thi Huyen Nhu’s case makes me feel insecure. What will happen if I am cheated by a bad bank officer and lose all the money I have saved for the last many years like the victims in Nhu’s case?” she questioned. Huynh Thi Huyen Nhu is now the main defendant in the case where VND4 trillion of some institutions and individuals was appropriated by Huynh Thi Huyen Nhu, former Acting Head of the Dien Bien Phu Transaction Office of VietinBank, and accompanies. The People’s Procuracy has accused Nhu of “swindling to appropriate the assets” of three banks, 9 companies and 3 individuals, for which she would have to pay back the sums of money to the institutions and individuals. Some lawyers believe that VietinBank, where Nhu worked for before her behavior was discovered, must take responsibility for the swindling case and compensate the victims in the case. The three victimized banks in the case have also asked the trial council to consider the responsibility of VietinBank in the case. However, VietinBank has denied its responsibility in the case, saying that the institutions and individuals were cheated when dealing with Nhu personally, not VietinBank. Meanwhile, the bank’s computing system was only the instrument for Nhu to implement her cheating. The “method” Nhu used to persuade the institutions and individuals to give money to her was that she promised very attractive interest rates for the borrowings – 20-100 percent per annum. The denial of the responsibility by VietinBank has made depositors feel insecure when dealing with the banks. “Bank credit officers, in the name of banks, cheat depositors, while banks still claim innocent. Who should depositors believe?” Huong said, adding that banks now still don’t have a strict monitoring mechanism to prevent swindling and protect customers. 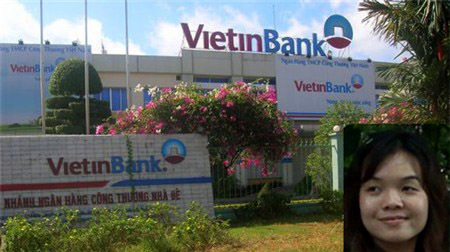 An official of the State Bank of Vietnam denied that the case showed a loophole in the bank corporate governance. “Will people still have confidence in the banking system if banks deny their responsibility and blame all the problems on individuals?” a banking inspector said. “It’s time to ring the alarm bell over the banking officers’ morality and the loopholes in the bank governance,” he added. Lawyer Truong Thanh Duc, Chair of the Legal Club of the Vietnam Banking Association, has warned that people would keep idle money in their coffers instead of depositing money at banks, if they lose confidence in banks.